Obviously, no comparison of workplace chat apps can go without the heavyweight champion, Slack. With more than 8 million daily users (3 million paid), it’s the most widely used chat app for workplaces around the world. Based on sheer numbers alone, Slack seems to be winning the chat app game (so far). The good stuff: The presence. 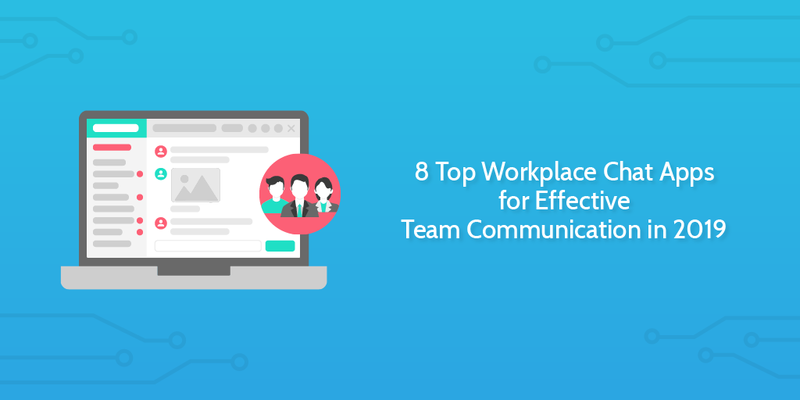 If your workplace is just about to introduce Slack, chances are, most of your workforce is already familiar with how it works. On top of this, Slack has hundreds of integrations to make it into a communication/productivity powerhouse. The bad stuff: As you can see from above, the majority of Slack users are on the free plan, which has quite a few downsides. There are only 10,000 searchable messages and 5GB of file storage in total, which runs out very quickly if you have a larger team. As a result, a lot of teams end up with messages they can’t view and files they can’t open. Then there are the integrations. While there is a metric ton of them, the free plan only allows for 10 at a time. Once you cover the basics (Google Drive, a project management app, a productivity app, etc. ), you’ll go through those 10 in a heartbeat. Another downside is that audio and video calls are only available between two users at a time on the free plan. If you have frequent video calls or conferences, you’ll be either forced to upgrade or move on to a platform such as Zoom or Appear.in. Slack pricing: $6.67 per user per month when billed annually for the Standard plan or $12.50 for the Plus plan. There’s a free plan which has the basic functionalities but comes with some limitations. Looking to disrupt the team chat app market, we launched Chanty as a Slack alternative that would do everything that Slack does (but better) and offer some cool features that other app doesn’t offer. Having launched out of beta recently, Chanty is looking to take Slack’s crown as the next big workplace chat app. The good stuff: Aiming to take a cut of Slack’s market, Chanty is fixing everything that Slack’s users don’t like. This means unlimited messages in the free plan (for up to 10 users), unlimited searchable history and 10GB of storage per free user. I may be a bit subjective here, but Chanty’s search option is much cleaner and faster than Slack’s as well. The bad stuff: Although a Zapier integration is up and running, Chanty is still far behind on the integration front. We have just launched one-on-one audio and video calls, as well as the feature of sending audio messages in Chanty, but can’t yet accommodate large video meetings. Chanty pricing: At $3 per user per month (paid annually), Chanty is looking to stir up the team chat app market with the most affordable offer out there. On a paid plan, you get 20GB of space per user, along with unlimited integrations and unlimited audio and video calls and screen sharing (once these options are live). If you’d like to pay on a monthly basis, the price is $4 per team member. In either case, Chanty is by far the most affordable option on this list, especially considering the available and upcoming features. Launched in 2014, Flock is just a year younger than Slack, so it got into the market early enough to take some of Slack’s market. Since then, they’ve been working hard to prove themselves and grab a piece of the team chat app market. They also have an interface in Spanish and Portuguese. The good: Flock is generally faster to load and use than Slack, according to speed tests and our team’s experience. The free package has unlimited integrations and one-to-one video calls. The bad: It could be our team’s experience only, but we had issues with uptime – we couldn’t access message history for several hours at a time. The free plan is limited to only 10,000 messages, just like Slack. Group video calls are limited to 20 users and up to 20 minutes per call. Flock pricing: The Pro plan is $4.5 per user per month when paid annually. Although this is cheaper than Slack, it’s still not the cheapest option out there. If you have a large team, you can contact Flock for the Enterprise plan and get special pricing. Think of Fleep like a platform between a team chat app and an email client. In fact, unlike the rest of the tools mentioned here, it’s probably better to think of it as a Skype alternative and not Slack. It allows you to message any person out there, as long as they have a Fleep account. If you want to have your own team (like a Slack workspace), you can do that as well – but it’s a paid option. In this way, you can have a single Fleep account and be a member of different conversations, projects, and teams, instead of making a separate account for each new workspace. The good: It combines email and chat in an easy-to-use way. It’s excellent if you communicate with different teams and don’t want 30 different accounts. The number of conversations and message history are both unlimited. The bad: If you want to use Fleep within your workplace, you are forced to pay for what they call “user account management” – essentially being an admin of your own space. Otherwise, you can use it as a messenger in the same way you would use Slack. Task management and statuses are only allowed within a paid plan. Video calls are possible but only through the appear.in integration. Fleep pricing: There is only one paid plan and it starts at 5€ per user per month. For larger teams, there is an Enterprise plan, which is available upon inquiry. Coming from the folks who built Windows, we had high expectations from Microsoft Teams. If you’re a Microsoft user already using Office 365, this is a great addition as it seamlessly integrates with other Office apps. If you’re dependent on Word, Excel and other apps a lot, this could be the team chat app for you. The good: For the price of $12.5 per user per month, you get Microsoft Teams, as well the entire Office 365 suite, including Word, Excel, Powerpoint and a number of other apps. That’s excellent value. The bad: Oh boy. Our experience at Chanty is that you don’t get Microsoft Teams unless you have nerves of steel. Setting up takes hours and requires a specific email and some very knowledge in advanced tech – not everyone can install it on their own. In other words, the user experience leaves much to be desired. Pricing: There are three plans – Free, Business Essentials ($5 per user per month) and Business Premium ($12.50). The free package on its own is great, with 300 maximum users and essentially all features of the paid plans. The file storage limit on the free plan is 2GB per user, while the Essentials plan gives as much as 1TB per user. All in all, Microsoft Teams seems to provide the best value for money spent. Launched in 2015, Ryver is one of the youngest and “coolest” Slack alternatives. Putting a huge focus on project management, Ryver aims to connect the experience of a team chat app and a PM tool in one place, for a great collaboration experience. The good: The task manager works and it’s a welcome addition to the usual chat options that other apps offer. The native integrations with Google Drive, Dropbox and Box are excellent since most users will require at least one of them. The bad: Ryver claims to integrate with over 1,000 apps using Zapier. This is all fine and dandy but setting up those integrations can take time. Moreover, those integrations aren’t really free since you will have to get a paid Zapier account. Speaking of payments, Ryver’s pricing is rather debatable. The starter plan is $49 per month for up to 12 users, while the Unlimited plan is $99 per month, for an unlimited number of users, of course. So, what if you have fewer than 12 users, or slightly more than 12? The pricing plans lack flexibility and really make sense if you have just under 12 users or anywhere more than 30-40 to go for the Unlimited plan. In other words, the more users you have, the better bang for your buck you get. Pricing: Besides the Starter and Unlimited plans, there’s an Enterprise plan at $399 per month, which comes with workflow automation, Single Sign-On, premium support and advanced team management. Whether that’s worth an extra $300 per month, it’s your call. Another cool new app to take on the competitive team chat app market, Glip promises better and faster team collaboration for free. How much of this they can actually deliver – remains to be seen. However, their competitive pricing and a great free plan make them a worthy competitor to the heavyweights in this field. The good: The task manager function is great. You can assign tasks to chat participants, drag and drop them, change their colors, filter them by different criteria and much more. If you have moderate project management needs, you can fully expect Glip’s project management tool to replace Trello. The bad: Testing out Glip for our reviews at Chanty, we found the onboarding to be not too pleasant, but your experience may vary. The chatting itself is okay, with our major complaint being that workspace admins can edit links without any trace of this happening in the app. Finally, if you want to make video calls, you can do so only by using the connected RingCentral app. Glip pricing: To keep it stupid simple, there are only two plans: free and Standard at $5 per user per month. By upgrading to a paid plan, you get up to 1,000 minutes of shared video chat per user per month along with some advanced administration controls and a few other extras. If you want a completely free team chat app, this is one of the better solutions as it doesn’t limit the paid plans too much. Last but not least, Process Street may not be a dedicated team chat app, but it can absolutely get the job done. By creating process templates and creating checklists, you can use Process Street to track progress and collaborate with your team. With Process Street, instead of chatting inside a workspace you would be communicating inside an active work-process. You run the checklist for a particular process and begin working on it. It may be that some of the other tasks in that checklist are assigned to other members of the team. You can enter information into a form field, check off the task, and they can be notified to come in and provide their response. You can also chat away in the comments beneath each task. You can @ mention anyone in your organization and communicate about a specific task. Process Street’s chat features are all designed to remove the distractions of larger team workspaces to give focus and clarity over what needs to be discussed. While the other chat apps are ideal for casual conversation, and their calling features are great for in-depth discussions, Process Street focuses on being the provider of effective asynchronous communication – delivering it in a distraction-free way to help boost that efficiency. Which team chat app will you choose? With many teams going remote and many others realizing the benefits of seamless team communication without the use of email, the market for chat apps is only bound to expand in the times to come. If you’re looking for a proven solution that is loved by many, go for Slack. However, note that Slack’s free plan is very limiting and the app itself can get rather slow with its enormous number of users. There are plenty of strong competitors in the list, so we’d recommend you check them out and see which one has the best feel for you. The market leader isn’t the only game in town. Which team chat apps have you used? Which ones do you like the most? Are there any we’ve missed off the list? Let us know in the comments below!